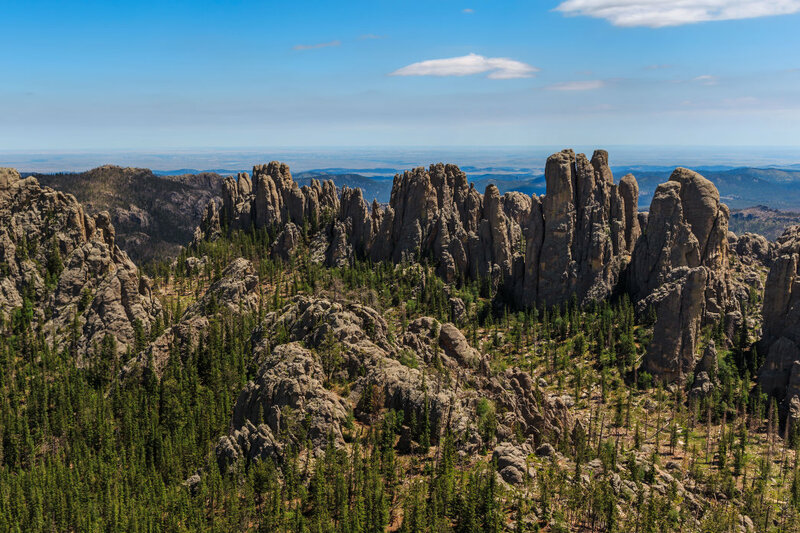 The Black Hills, in western South Dakota and northeastern Wyoming, consists of 1.2 million acres of forested hills and mountains, approximately 110 miles long and 70 miles wide, a hikers and naturalist paradise. The Black Hills rise from the adjacent grasslands into a ponderosa pine forest. Described as an “Island in the Plains,” the Forest has diverse wildlife and plants reaching from the eastern forests to the western plains. The Forest is a multiple-use Forest with activities ranging from timber production, grazing, to hiking, camping, mountain biking, horseback riding, rock climbing, mining, wildlife viewing and many others. The four seasons offer amazing opportunities to view and enjoy nature on the Black Hills National Forest. In the springtime, flowers abound on the forest floor. Fall colors brighten the hills and white winter snow illuminates the surroundings. Forest lakes glisten bright blue on summer days, and summer nights offer magnificent opportunities for star gazing. Enjoy yourself while viewing the many rugged rock formations, canyons and gulches, open grassland parks, tumbling streams, and deep blue lakes.